You'll find us in the historic Kerrytown District of Ann Arbor. 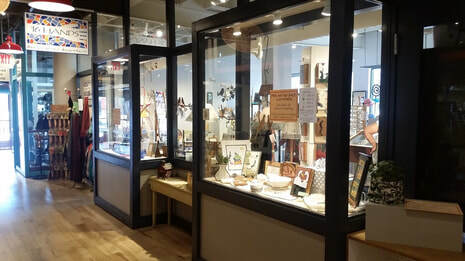 We're right next to the Farmers Market, on the 2nd floor of the Kerrytown Market and Shops building, directly above Sparrow Market, and across from The Spice Merchant. Our building is home to a number of cool, locally owned specialty shops and we all do our best to make shopping easy and fun. It is also just one block west of the world class Zingerman's Deli. Metered parking (coin and credit cards accepted) is available right next to our building and there is free parking after 6pm and on Sundays. Parking is limited when the Farmer's Market is open (Wednesdays and Saturdays 8am-2pm) and the we recommend parking in the Ann/Ashley structure. Artist submissions are reviewed periodically throughout the year. We are currently full and not accepting submissions except from local makers/ artists. We will post it here when we are accepting new work again. When we are accepting new work again, the way to apply is to email 5-6 images of your work along with information about pricing, a bit about yourself and what makes your work special, to 16handsinfo@gmail.com. Due to the high volume of applications we receive, we cannot guarantee that we will respond to all submissions. Please keep in mind that if we decide not to show your work, it reflects what we are looking for and have room for at that particular time, and may not be a reflection of your work at all.